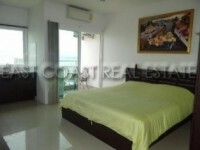 Nova Mirage condominium is located along Wongamat beach, in Naklua (North Pattaya). It is just 200 meters from an amazing beach, with glorious views back across the skyline of Pattaya and out across the sea to the Koh Larn island in the distance. This area of the city is very nice, clean and quiet, yet has many amenities close by and even some 5 star hotels. Nova Mirage condominium provides all owners access to a large freeform lagoon swimming pool, and poolside gymnasium. There are many on-site services such as laundry, maids cleaning and even taxis to various sights and landmarks. There is also a Thai restaurant, massage and spa. This studio is located on the 7th floor of the newest building and has amazing sea view. It is a studio layout offering a fitted European kitchen, bathroom, air conditioning and full furniture. The property is for sale in foreigner quota, with all tax and transfer fees split 50/50 with the owner.